Home entertainment RIP | Boxing Legend, Muhammad Ali Is Dead! RIP | Boxing Legend, Muhammad Ali Is Dead! Legendary boxer, Muhammad Ali, 74, who was rushed to a hospital outside Phoenix, Arizona and reportedly on life support after he was found ‘barely breathing’ at his home on Thursday has died. Ali was surrounded by his family who rushed to be at his bedside on Friday after doctors warned his condition was ‘rapidly deteriorating’, Radar Online reported. 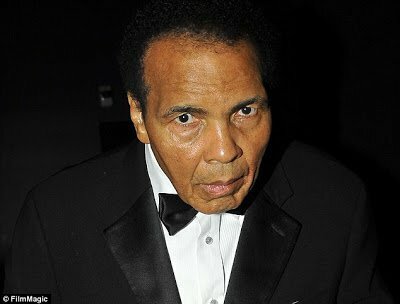 Ali was taken to hospital on Thursday with an ‘unshakeable cough’ which was complicated by his Parkinson’s disease. May his soul rest in peace…Amen!